The standard S5 Cream is one of our best sellers. A topical antiandrogen without any side effects is the holy grail in hair loss treatment for both men and women hoping to prevent further hair loss. The makers of S5 Plus Cream have taken Topical Spiro to a whole new level. S5 Plus contains 2 additional pharmaceutical-grade ingredients that hair loss sufferers have been trying to get their hands on for years, because the data is just “that impressive”. What is S5 Plus Cream? Who is S5 Plus for? S5 Plus Cream differs from the standard S5 Topical Spironolactone product in two important ways: The addition of two extra pharmaceutical-grade ingredients: Alfatradiol and Tempol. These two additional ingredients take the antiandrogenic effects to another level, providing significantly greater efficacy in the prevention of further hair loss. Who is S5 Plus Cream For? 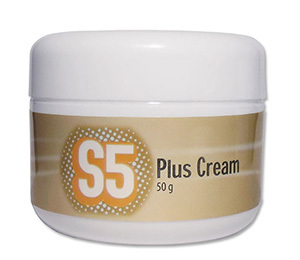 S5 Plus Cream is for men and women with thinning hair who wish to stop it from continuing. More importantly, its for users of Topical Spironolactone who want to add a powerful extra punch to their regimen. With the addition of these two extra ingredients not found in the standard Topical Spiro, hitting hair loss from multiple angles is now possible, in one treatment. This is an ideal product for guys who are worried about side effects from Propecia, and an outstanding addition to Propecia, providing direct antiandrogen effects directly on the scalp. Its major role is keeping your hair from getting any worse. Do not underestimate the importance of this. You must stop the cause of your hair loss to see optimal results from growth stimulant treatments like Rogaine Foam. How does S5 Plus Work? Men and women who experience thinning hair due to androgens (hormones) are dealing with a sensitivity to these hormones in their scalp. For whatever reason, certain follicles become exposed to these androgens through certain “receptors” in the follicle. When these hormones circulate to the follicle, they create an inhospitable environment, and the production of these hairs begins to suffer. This is a very dumbed-down explanation of what happens when hair begins to thin in men and women. The key with treating hair loss has always been finding ways to either (1) Stop the hormones from getting to the hair or (2) Protect the receptor sites from being exposed to these hormones. So there have been a few treatments on the market that do this very thing. For example, Propecia (taken internally) is extremely effective because it reduces the quantity of these androgens floating around the body altogether. This reduces the damage that is done to hair follicles, and results in an 83% effectiveness rate after 12 months of use. How To Apply S5 Plus Cream? We’ve put together the following article on how to apply S5 Cream for that very purpose. It also gives you information on how often it should be applied, the best time of day to do so, and other important tips. Then you have treatments like Topical Spironolactone. Women often are prescribed oral Spironolactone, which does something similar. But with both Propecia and oral Spiro, you’ve got the possibility of side effects. Spironolactone is the active ingredient in the standard S5 Cream. This is a topical formulation and it acts just a little differently than Propecia does. Whereas Propecia will reduce the quantity of circulating hormones throughout the body, Topical Spironolactone plays the alternate role mentioned in #2 above: It protects the receptor sites from exposure to the hormones. It does this by blocking the receptor site and binding to the receptors instead of the androgens doing so. And this is exactly why Topical Spironolactone is considered synergistic with Propecia. It does something a little different. It hits hair loss from another angle. It’s an “androgen blocker”, and it works perfectly alongside DHT inhibitors like Finasteride. So the Topical Spiro in S5 Plus blocks the androgen receptors and protects your follicles. But the makers have just taken the concept of synergy to a new level. The topical Alfatradiol actually plays the role of Propecia as a 5-alpha reductase inhibitor locally, in the scalp. You see, treating hair loss effectively involves understanding the various mechanisms that cause it in the first place. And then making intelligent decisions about how to address those mechanisms. Hitting hair loss from several angles is without a doubt the most intelligent approach you can take. Whether you are a male or a female, it doesn’t matter when we’re talking about thinning hair. So Propecia inhibits 5a-reductase in the bloodstream, and Alfatradiol will do it locally in the scalp. If you’re taking Propecia as well as S5 Plus Cream, you’re literally addressing three different major causes of hair loss all at the same time. This puts you pretty much at rockstar status as a hair loss treatment nerd, and the gods of full-heads-of-hair are going to smile down on you, in your infinite wisdom. Studies have been done on Alfatradiol, too. A clinical study performed in Germany revealed that Alfatradiol performed well at slowing down and stopping the progression of hair loss in the people it was tested on. It was used in conjunction with Rogaine, which is another incredible technique, as Minoxidil will stimulate growth, while S5 Plus Cream protects the follicle from further damage. For those that can NOT tolerate Finasteride, they should definitely try this product, and for those who can, well – you’ll be the envy of hair loss sufferers everywhere. So what about the other unique addition to the solution, called Tempol? We’ll lets take a look at yet another known factor in the development of hair loss: Oxidative stress. Oxidative stress is basically the biproduct of various natural processes in your system. It can come in countless forms, but it is often viewed as the “waste” that is produced from various processes that your body carries out. This waste is referred to as free-radicals. Free radicals are responsible for all sorts of nasty things that go on in your body, usually causing damage to cells, membranes, and even DNA. The question has always been: how do we clear out free radicals, and exactly what do they have to do with hair loss? This is usually handled with Antioxidants. Scientists have found that oxidative stress seems to be a critical component of Androgenetic Alopecia. How it progresses, and whether it progresses. Multiple studies have been done which indicate that this is true, so it stands to reason that an anti-oxidant included in a hair loss treatment would be of paramount importance. Tempol is a SOD mimetic. This means its an artificial version of a type of Antioxidant known as an SOD (Superoxide Dismutase). SOD’s take free radicals and break them down, ultimately into harmless chemicals which can then be removed naturally from the body. This effectively controlls oxidative stress, and removes all the nasty things that Free Radicals try to accomplish. In this study, SOD2 (an intracellular anti-oxidant enzyme) was downregulated in prostate cancer. This contributed to Alpha Reductase overexpression. Tempol was able to lower cellular superoxide levels and inhibit Alpha Reductase in that study. Simply put, if you are a male or a female with thinning hair, and you’d like a topical solution that is literally about the best you can get with today’s technology, S5 Plus Cream is a mandatory part of your hair loss treatment regimen.